Dear Editor | Is My Novel Good Enough to Publish? Is My Manuscript Good Enough to Publish? The advent of ebooks and print on demand (POD) technology means everything is publishable. But, to misquote 1 Corinthians, you might have the ability to self-publish, but that doesn’t make it a good idea. It’s especially not a good idea to self-publish through some “service” aka a vanity press—apart from the quality issues, it’s not good Christian stewardship to spend thousands on something you could organise yourself for a fraction of the cost. So is My Manuscript Good Enough to Publish? Anyone can publish anything at any time. But just because we can doesn’t mean we should. And when people say “publish”, they usually mean published by a reputable publisher. Is your novel good enough for your dream publisher? In order to get signed by an agent, you’ll need to have credibility as a writer. One way to build credibility is to enter and final in major writing contests. And you’ll probably need to attend a major US Christian writers’ conference such as the American Christian Fiction Writers conference, as major conferences give you the opportunity to meet agents and publishers in person. Your novel will need have to have sales potential. Big sales potential. Close to You, Kara Isaac’s debut novel, capitalised on the US love for all things Lord of the Rings by having an American hero and a Kiwi Lord of the Rings tour guide heroine. 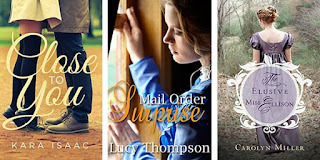 Mail Order Bride, Lucy Thompson’s debut historical romance, is set in Colorado and utilises the much-loved mail-order bride trope. There may even have been a cowboy. The Elusive Miss Ellison, Carolyn Miller’s upcoming debut, is a Regency romance set in England. Australian publishers love books by Australian authors with Australian characters and settings. They tend to accept submissions direct from authors (so no literary agent required), and it’s easier to get to meet them in person (the best opportunity for Christian writers is at the Omega Writers’ Conference in October). Personal connections help. The downside is the Australian market is smaller, which means fewer potential buyers (a fact many Australian authors have lamented on). It also means our small publishers can’t publish every manuscript they see, much as they might like to. There are a myriad of smaller Christian publishers, mostly in the US, who may be open to submissions. If you want a free list of over 100 publishers who publish Christian fiction, click here to sign up to my mailing list. This list does not constitute an endorsement, and I don’t recommend any specific publishers … although there are a few I recommend people steer clear of (like the publisher which offered me a publishing contract without actually seeing my manuscript. Or the publisher sued for deceptive practices. Or the publisher convicted of extortion). There is also the aspect of writing craft: is your manuscript good enough? The bigger the publisher, the better your manuscript has to be. There are so many authors fighting for an ever-decreasing number of publishing slots that anything less than excellent isn’t good enough to get the attention of a major publisher. Publishers get so many excellent submissions that they don’t have time for could-be-excellent submissions or almost-excellent submissions or submissions they can’t see a market for. The most saleable manuscripts are those which fit clearly into a popular genre. With novels aimed at the Christian market, this includes meeting the expectations of CBA readers, and being careful regarding ‘edgy’ content—topics so expansive I could write a book about them. The closer your manuscript aligns with a popular and established genre, the easier it’s going to be to sell to a publisher. But what if you don’t fit a popular genre (e.g. Christian Science Fiction, or New Adult)? This is when you might consider self-publishing. But if you pursue self-publishing, pursue excellence as well. Don’t self-publish as a shortcut, to fulfil your publishing dream. Instead, write something good enough to win a major contest or be published by your dream publisher, and choose to self-publish because that’s what you believe God has set out as your path. To go back to the original question. Your challenge is to work out how you want it to be published, and do the work necessary to achieve that. Start by checking out 9 Keys to Writing Your First Novel. And pursue excellence. Over the last three weeks we’ve looked at trade publishing, publishing through a small press, and self-publishing. Any of those can be good options for authors, depending on your genre, writing, and aspirations. If money is flowing from the author to the publisher, that’s commonly referred to as vanity publishing. And that’s one of the first ways you can tell whether a publisher is a vanity press: they claim they are not. Instead, they say they are a co-operative publisher, a partner publisher, a subsidy publisher, a hybrid publisher, a self-publisher or even a traditional royalty-paying publisher. Vanity publishers are experts at appropriating the language of legitimate publishing in order to squeeze money from the uninformed. The key way to distinguish a genuine publisher from a vanity press is to consider how the publisher makes money. A trade publisher (large, small or micropress) or a self-published author make their money the same way: by selling books to readers. A vanity publisher makes money differently: by charging authors. The most common vanity publishing business model is pay-to-publish—selling publishing packages to authors. Packages vary in cost and quality, but start at $999 and go up into the thousands. Packages don’t routinely include editing, even when it is obviously needed. The author is encouraged to pay extra for marketing opportunities, which can be anything from blog tour to expensive print advertising at roughly the price of a new car (often double the price of advertising directly through the newspaper or magazine). The other common vanity publishing model is the purchase requirement—publishing “free” but requiring authors to purchase a minimum of 1,000 copies of the published book (an estimated minimum cost of $10,000). This more than covers the publisher’s production costs, but leaves the author with hundreds of paperbacks and no way of selling them. It would be nice to think that publishers operating in the Christian market would be better than this, that they would be honest, truthful, looking out for the best interests of everyone … you know, Christian. But there are many vanity presses specifically targeting the Christian market, perhaps because Christians tend to trust other people who say they are Christians. If you don’t believe me, check out Tate Publishing. Some publishers offer author services, and it can be difficult at first to tell whether it is a vanity publisher, or a printer specialising in book printing who has expanded their services into areas like cover design, editing, ebook creation, and distribution. This is especially the case when the publisher offers both traditional publishing and services for authors intending to self-publish. An author services company may also be able to assist with uploading electronic ebook files to online retail sites such as Amazon and iBooks, and with uploading the files for the paper books to sites such as Amazon KDP and IngramSpark. Some of these providers are specialists serving the author community, companies like printers or distributors. But some are not. Some are offering overpriced services. Some aren’t delivering on the services they offer. Some are offering useless services, like pitching to a Hollywood agent. Above all, services should represent good value for money—and that’s my worry with author services providers. Authors can almost always find better value services from freelancers who have less overhead to cover. Then the author is self-publishing, which we discussed last week. As Christians, we are called to be wise stewards of our time, talents and resources. That means understanding the different publishing models, and not getting caught in the snare of a vanity press. It’s not good business, and it’s not good stewardship. Instead, learn the basics of self-publishing and ask for (or pay for) help when required. This is the final article in this series. If you’d like to know more about any of the topics raised over the last four weeks, please leave a comment below. Over the last two weeks, we’ve looked at two paths to publishing: working with an agent to attract a major trade publisher, and publishing through a small press or micropress. This week we are looking at the third option: self-publishing. These, along with affordable print-on-demand (POD) services mean no author needs to get stuck with hundreds of copies of unsold paperbacks. Unfortunately, it also means anyone who can type and open an email account can publish on Amazon, which has led to the “tsunami of carp” (at least, that’s what was called on the old Amazon discussion forums. They had strict guidelines around language). Self-publishing is also referred to as indie publishing, a reference to the indie film industry. As indie film-making is making and distributing a film independently of the major film studios, indie publishing is publishing and distributing a book independently of the trade publishers. However, self-publishing is also somewhat of a misnomer, as it implies the writer is publishing alone. This isn’t true: there are many tasks which have to be completed in order to publish a book, and the savvy self-publishing author knows they will need to outsource some of those tasks. Someone (who isn’t related to you) needs to go through your manuscript and suggest how it can be improved. This can be a critique partner or beta-reader (in which case they help for free on the understanding you will return the favour) or a developmental or structural editor. Even the best editor can’t proofread their own work. We read the words we intended to write … which might not be the words which actually ended up on the screen. We need one (or more) editors as part of our publishing team. This is best outsourced unless you are a trained graphic designer with experience in book cover design. Then there is a range of tasks which a savvy author can learn to do themselves, or can outsource as time and money permit. The essence of self-publishing isn’t that the author does everything themselves, but that they are in control of the process and contract out those parts of the process they can’t do themselves (like editing) or that could be done better by a professional (e.g. cover design). Some contract tasks like social media updates or website maintenance out to a virtual assistant. Those who choose to self-publish will be responsible for everything. You will either have to do it yourself, or pay (or bribe or beg) someone else to do it for you. This involves a lot of decisions, and you would be wise to get advice from someone who has been through the process before (and recently – things can change very quickly, particularly when it comes to e-books). Some authors are known as hybrid authors: they have some self-published some books, and have others published trade publishers. Author Earnings reports suggest hybrid authors have the best of both worlds: they have the advantage of having books in physical bookstores which helps develop a reader base. They have some marketing support from the trade publisher, and while this is specifically for their trade-published titles, it will build name recognition, which will carry over into their indie titles. Next week we’ll look at the final option around publishing: using external author services to publish. It sounds like a great idea, but there can be a real sting in the tail for the unwary. Last week I talked about traditional publishing, specifically discussing large publishers. This week I’m looking at another area of traditional publishing: the small press. Small presses and micropresses follow the same business principles as the major traditional publishers. Small presses take on the full financial responsibility for publishing and distributing the book, although you’re less likely to see their books on the shelf at your local store, or in your library. Many will accept direct submissions from authors. Few small presses pay advances, but all pay royalties. As with trade publishers, reputable small presses don’t charge you for publishing or require any compulsory book purchases (if they do, they’re a vanity press, which we’ll get to in a later post). Small presses are more likely to be owned by individuals. Trade publishers are often owned by multinational corporations or churches (in the Christian arena). This means the person you are dealing with in a small press has an actual stake in the success of your book. The owner may well be the acquisitions editor, the structural editor, the line editor, the copy editor, the proofreader, the formatter, the cover designer, and the sales and marketing department. This has advantages and disadvantages: it means the person you’re dealing with is the one with the power to make decisions, but it may mean the publisher becomes stretched too thin, or are undertaking roles they aren’t suited for. A small press is less likely to pay advances. However, they often pay higher royalties than the major publishers, especially for digital sales (although it can be argued a higher royalty rate is only useful if the book is selling). Small presses may offer digital-only or digital-first contracts. This means only books with a high enough ebook sales record will get printed and distributed. Alternatively, they may sell paperback copies through a print-on-demand service such as IngramSpark rather than printing and distributing stock (because printing and warehousing costs money). Small presses may not distribute to bookstores. This is a factor of cost: books are distributed to bookstores on a sale-or-return basis, and a small business may not have the financial backing to make in-store sales financially viable. Most small presses accept unsolicited submissions from unagented writers. However, just because you can submit doesn’t mean you should. I find many small presses produce books with bad writing, amateur covers, insufficient editing, and little or no marketing support. You might be better off self-publishing (or not publishing) rather than submitting to a bad small press. They can’t be all things to all people, and they don’t try. Cover art will be professional, and reflect the specific genre. While their cover art won’t reach the standard of the best Big Five publishers, it will be as good as the cover art of the best indie publishers. Readers do judge books by their covers, and many of the small presses (unfortunately) feature cover art best described as average. The writing and the editing should be excellent. I often find the copyediting is solid, in that there are few or no typographical errors, but there are fundamental writing issues (e.g. headhopping, or telling not showing). Mistakes like these show the publisher or their editors lack an understanding of the essentials of good fiction. Small presses who produce excellent non-fiction may well be lacking in the necessary skills to produce excellent fiction—and vice-versa. Books are available in major online stores. However, books may not be available in physical bookstores, especially if the small press utilises a digital-first or digital-only model to control costs. Prices are competitive for both ebooks and paperbacks. Readers are unlikely to pay more than USD 5.99 for the ebook version of a full-length novel (80,000–90,000 words) from an unknown author or publisher. Paperbacks should retail at USD 12.99—USD 15.99 to be competitive with the major publishers. Once you are confident the small press has the high standards your book deserves, make sure your book shines. To employ a cliché, you only get one chance to make a first impression, and you don’t want to waste that chance on a manuscript that has issues you didn’t fix because you didn’t know they were issues. There are an increasing number of small presses and micropresses publishing Christian fiction. To receive a current list, click here and sign up to my monthly newsletter. Next week I’ll be looking at self-publishing and hybrid authors (authors who trade publish and self-publish). Meanwhile, what questions do you have about small presses? What advice do you have to share? When new writers ask how to get published, they’re usually asking how to get published by a traditional royalty-paying publisher, one who will get their books in bookshops. What they often don’t know is there are other ways to publish—and there are “publishers” who prey on newbie writers. It’s important for all writers to know and understand the main paths to publishing, and the advantages and disadvantages of each. Note that while these are all options, only three of them are options worth considering, and the “best” option will depend on your personal aims in writing and publishing. There is no one right answer for everyone. But there is one wrong answer! Trade publishing is the official term for what can also be called traditional publishing, trad publishing, or legacy publishing. It’s what most people mean when they say “publishing”. If you visit your local bookstore or library, most of the books you see on the shelves will have come through these big trade publishers, with names like HarperCollins, Penguin, Random House, or Simon & Schuster. Most publishing houses have a range of imprints, each of which will target a different market. For example, Harlequin, Love Inspired, Mills & Boon, Thomas Nelson and Zondervan are all imprints of HarperCollins. Few trade publishers accept direct submissions from new authors, preferring to deal directly with literary agents. (Click here to read my post on how to find a Christian literary agent.) Authors are paid through advances and royalties, with a portion (usually 15%) of each payment going to their agent. Under the trade publishing model, an author writes a book, and a publisher purchases the rights to publish and sell the book in specified formats (e.g. hardcover, paperback, digital, audiobook) and in specified locations (e.g. the United States and Canada, Australasia) in a specified language (e.g. English). In return for the specified rights, the publisher will pay the author a royalty on the sale of each book. The royalty is expressed either as a percentage of the recommended retail price, or as a percentage of the actual selling price. Trade publishers may also pay an advance. A publishing advance is similar to asking the boss for an advance. It is an up-front payment which will be credited against future earnings (in this case, royalty payments). An author who gets an advance won’t get any other payments from the publisher until the book has sold enough copies that the royalties on the sold copies equal the advance payment made. In publishing terms, this means the advance has “earned out”. For many Christian fiction authors, this is the publishing dream. A contract from one of the major publishers, whether a Big Five imprint, or one of the major independent publishers operating exclusively within the Christian fiction market. These are probably are the publishers who publish your favourite Christian writers, authors like Irene Hannon, Karen Kingsbury, DiAnn Mills, James L Rubart or Susan May Warren. These are the paperbacks you see in your local Christian bookstore, online at Amazon or Christian Book Distributors or Koorong, and in large print hardcover at your local library. The big publishers publish four or more fiction titles a month. They have beautiful covers. The books are well written and well edited. The authors have pretty websites. Their Amazon pages are full of glowing reviews (often because the publishers have included an expensive blog tour as part of the book’s marketing package). It’s easy to see why any Christian fiction author would want to be published with one of these companies. It’s a sign you’re a ‘real’ author; you’ve made it. But there is a down side. While these publishers produce four or more fiction titles a month, that’s only a tiny fraction of the manuscripts submitted to them. Most of their books will be from established authors. They may have as few as six slots in their annual publishing schedule for novels from a debut authors. That means a lot of competition for those coveted publishing contracts, and a lot of pressure to deliver in order to win the next contract. Next week, I’ll be back to look at small presses: trade publishers which don’t require an agent. In the meantime, what questions do you have about trade publishing? My previous two posts looked at Understanding Copyright and How and When Can I Use Copyrighted Material? As I mentioned, creators (including authors and bloggers) can use copyright material without permission when it falls under the doctrine of fair use or fair dealing. That’s what we’re discussing today. As you read this, please note that I am not a lawyer, and this is not legal advice. There is a lot of great information about copyright on the internet, but none of it is legal advice. To get legal advice, you pay a lawyer licensed to practice in your state or country. What is the Doctrine of Fair Use or Fair Dealing? The doctrine of Fair Use (US) or Fair Dealing (UK and New Zealand) permits limited use of copyrighted material without permission. The key word here is ‘limited’. You can’t copy everything. But there are no clear guidelines as to how much you can copy. When Does the Doctrine of Fair Use Apply? For the purposes of research or private study. To allow for criticism or review. For the purpose of reporting current events (excluding photographs). These are pretty straightforward yes/no questions for those who are using copyrighted content. However, the use also needs to be ‘fair’, which isn’t so easy to define. ‘Fair’ can include consideration whether the use of the work affects the market of the original work, whether the amount used is reasonable and appropriate, and whether the original creator receives sufficient acknowledgement. Overall, while the UK and the US use different language, the intent is the same: to prevent the inappropriate unauthorised use of copyrighted material. Is the original work covered by copyright? Is my proposed use commercial? Is my proposed use transformative? How much will I use? The date the work was first published. Where the work was first published. As a general guide, anything first published before 1923 is likely to be in the public domain. Note that these are US resources. These sources may not give correct information if the work in question was first published outside the US. Copying or reproducing copyrighted material is more likely to fall under fair use if there is no commercial benefit to the user. This means churches can quote a verse of the week in a church bulletin, but can’t reproduce and sell the Book of Acts. A quote in a free blog post is more likely to be considered fair use than the same quote in a paid book or training course. The underlying rationale of this rule is that the public reaps benefits from your review or blog post or news report, and that benefit is enhanced by including some of the copyrighted material. Of course, the original author may reap some benefit as well, especially if it’s a glowing five-star review. Transformative use implies that there is more original work than quoted work. Quoting a hundred words from another author and adding a sentence of your own is less likely to be considered transformative than quoting a sentence from another author and adding a hundred words of your own (I may be wrong. But I don’t want to be the test case. Do you?). Parody imitates a well-known work in a comedic way (think Weird Al Yankovic or The Key of Awesome). Parody permits extensive use of the original. Print examples include Where the Wild Mums Are and Where the Wild Dads Are. The day Mum didn’t get dressed and went on strike, Dad called her ‘a Wild Thing’ and Mum said ‘Cook your own dinner’ and stomped off upstairs to have a bath . . . The larger the proportion of the total work quoted, the less likely it is to be considered fair use. Even a smaller percentage of the work can be an infringement if it constitutes the heart of the work being quoted. This question of proportion is relevant with song lyrics. A book meme (i.e. non-commercial use) quoting ten words from an 80,000-word novel is likely to be considered fair use. A novel (i.e. commercial use) quoting ten words from a 200-word song is less likely to be considered fair use. A novel quoting an entire poem is not fair use. Courts evaluate fair use claims on a case-by-case basis … there is no formula to ensure that a predetermined percentage or amount of a work—or specific number of words, lines, pages, copies—may be used without permission. If in doubt, leave it out. Do you have any questions or advice on copyright or fair use/fair dealing? Copyright for Writers: How and When Can I Use Copyrighted Material? Last week, my post introduced the concept of copyright and how it applies to authors. The most common question in the comments was about legally using copyrighted material in our own work. Today I’m discussing when and how authors, bloggers, and other creators can use copyrighted material. As you read this, please note that I am not a lawyer, and this is not legal advice. There is a lot of great information about copyright, but none of it is legal advice. To get legal advice, you pay a lawyer licensed to practice in your state or country. When Can I Use Copyrighted Material? Not everything is covered by copyright. Works which are not under copyright are considered to be in the public domain. This includes works published in the US before 1 January 1923, or works by authors who died more than seventy years ago (although this “life plus seventy” rule is lower in some countries). Facts and ideas are not covered by copyright, but the original expression of those facts and ideas is. However, it’s still a good idea to disclose the source of your facts (especially in the modern era of fake news). Some work on the internet is covered by a Creative Commons licence—the best example is WIkipedia. This means people can copy without permission, although they should still give the correct attribution. Copying without attribution is plagiarism. There are several types of Creative Commons licence, and you can find out more at CreativeCommons.org/. Many government publications can be reproduced without permission in many circumstances. US government publications are public domain in the US, but copyright outside the US. Many Commonwealth countries use Crown copyright, although the specific regulations in each country are different. In Australia, the Crown holds copyright to anything first published under direction or control of the government. Legislation and other “prescribed works” may be copied and sold, as long as the sale price doesn’t exceed the price of copying. In New Zealand, all work produced by government departments and MPs as part of their work is copyright to the Crown. Legislation and certain other documents do not carry any copyright. Logos, emblems, or trademarks can’t be reproduced without permission, probably because that could lead to “passing off” (e.g. the scam emails with official logos claiming you owe money to a power company you don’t use). Doesn’t use the material in a derogatory manner or a misleading context. Acknowledges the source and copyright status of the material. These make good guidelines for sharing any material produced by someone else, whether under copyright or in the public domain. Creative Commons and Crown copyright are effectively forms of the copyright holder giving blanket permission for creators to use their material, as long as creators abide by specific rules. Bible translations are subject to similar terms, as I mentioned last week. For everything else, creators need written permission from the copyright holder … unless their copying falls under what the US government refers to as “fair use” and the UK and New Zealand governments refer to as “fair dealing”. It’s too much to cover in one blog post, so I’ll cover fair use in my next post. Meanwhile, let’s look at one more important question: how can we use copyright material? How Can I Use Copyright Material? If you want to use copyright material for commercial purposes (i.e. in a book you plan to sell for money), seek written permission from the copyright holder in advance, or ensure your use is covered by fair use/fair dealing (which we’ll discuss in my next post). Including the quote in quotation marks. Changing the look of the quote by using a different font, a different font colour, or a different font style (e.g. bold or italics). Separating the quote from the main text by indenting it or placing it in a box. Not identifying quotes is plagiarism—passing off someone else’s work as your own. This is easy on the internet—you just need to add a hyperlink to the relevant article or blog post. It’s a little harder in a paper document, but that’s why Word includes a References section, so you can easily add captions, citations, footnotes, and endnotes. Provide attribution to your sources even if they are out of copyright—passing someone else’s work off as your own is plagiarism. It might not be illegal in your jurisdiction (although it is in the US), but it is unethical. Ensure your quotations are accurate—don’t change the meaning. Keep your quote as short as you can while still making your point. The longer your quote, the less likely it is to be considered fair use or fair dealing. Note that there is no official formula (e.g. using less than 10%). If you’re still not sure whether you can copy something … don’t. Dear Editor | Should I Publish with a Small Press? This post was prompted by a question from an unpublished author who follows me on social media and subscribes to my newsletter. She participated in a Twitter pitch session, and an editor from a small press expressed an interest in her manuscript. Did I know anything about the small press? Would publishing with a small press hinder her chances of winning a publishing contract from a bigger press in the future? This author shows good judgement: she using her contacts to determine whether this is a good opportunity for her to pursue before going further. This means she isn’t going to end up like another author I saw, celebrating the fact she’d just signed a contract with Westbow Press, who advertise themselves as an imprint of Thomas Nelson … and hide the fact they are a pay-to-publish press with all services provided by the notorious Author Solutions. My first question to this pre-published author was to ask if she has an agent. She didn’t, which is what I expected. After all, this is the kind of conversation I’d expect an author would have with their agent. An agent would be the best person to talk to regarding whether publishing with this small press would help or hurt your chances of getting picked up by a larger press in future. In this case, the small press’s author list shows several authors who have been published by larger publishers, but I think most of them have gone from the big publisher to the small publisher, not the other way around. As a guide, large publishers don’t take direct submissions from authors, but prefer to work with recognised literary agents. On the other hand, most small presses do accept submissions directly from authors. Some prefer to work directly with authors, while others will also accept submissions from agents. Some small presses only accept submissions from agents. Others prefer authors who have previously been published with one of the major CBA publishers. If you don’t have an agent, then it might be easier to get one with a publishing contract in hand. If so, find an agent who believes you have a shot at some of the bigger publishers. How do you tell a good small press from a less-good small press? What is the standard of writing and editing? Have any of their books finalled or won any of the major industry awards? In Christian fiction, this means the Christy Award and the Carol Award, not Readers Favourite or any “award” that has as many entrants as winners. And is the standard of writing and editing consistent across different authors? Some small press authors use freelance editors before submitting their work, which suggests the author is using the publisher for their distribution and marketing capability rather than their editing capability. I’m not in the US so don’t visit US bookstores. My understanding is that most small presses focus on Kindle and online sales. They are you’re unlikely to see their titles in a store (having said that, a local store may well stock small press books by local authors, if there is an interest in that). If your dream is to see your books on the shelf at Barnes & Noble or Walmart, then publishing with a small press isn’t likely to make that happen. All authors have to do a lot of their own marketing. Authors have to create and maintain an author platform, and communicate with their fans through their website, social media, and newsletters. Submitting their books to relevant high profile print reviewers. Advertisements in the catalogues which are sent to libraries and bookstores. NetGalley listings to help them get those all-important consumer reviews. But small press authors can’t expect anywhere near that level of support, which leaves them starting from almost nothing. Most small presses are cagey about the sales and earnings information they release. You can get a rough idea of sales by checking Amazon sales rankings—the lower the number, the better. A publisher with books in the Top 100 of the relevant category or in the top 10,000 of the whole Kindle store is better than a publisher with titles languishing in the millions (or, worse, with no sales ranking, because that means the title hasn’t sold a single copy on Amazon). But what about the alternative? What is the small press offering that an author couldn’t do by themselves if they chose to self-publish? Authors can hire editors and cover designers and formatters. Authors can make books available for sale through Amazon and other online outlets (in ebook and paperback format). Authors can market their own books. Signing with a small press means giving up control of your manuscript. You wont’ get to choose your editor or your cover designer. You might not even like your cover. Someone else will decide what stores your book is available in, at what price, and in what formats. Someone else will decide what categories your book is listed on at Amazon and other online stores. And you won’t have access to your sales data. You’ll get a royalty statement every month or (more likely) every six months. That limits your ability to market your book. Without real-time access to sales information, you have no idea whether your promotion efforts are working. Even monthly information isn’t good enough. You need to be able to see how an advertisement at site X impacts your sales vs. an advertisement at site Y. A self-published author has that information, so can make those decisions. Big publisher, small press, or self-publishing? All are viable options, with advantages and disadvantages. But you are the only person who can decide on the right decision for you and your book. What advice would you give to someone considering publishing with a small press? If you’re reading this, you’re probably a writer. But you weren’t always a writer. Once upon a time you were a reader and—perhaps—an aspiring writer. I’ve always been a reader. A bookworm, if you like. And like many readers, I also wanted to be a writer. Specifically, a novelist. I won two school writing competitions in high school and even went on a creative writing camp, but the endless essays of high school and university didn’t leave much time for personal reading or writing. I didn’t know much about the publishing industry. Okay. I didn’t know anything about the publishing industry. I started reading for pleasure again when I got a job, but not writing: I already spent enough hours a day in front of a computer, writing client reports and our company newsletter. I had one colleague whose wife was writing a novel. I asked how it was progressing: he said she was still in the research phase, which was going to take her a year. I asked a few more times but stopped asking when I got a look that said she wasn’t making much progress (or not making as much as her husband thought she ought to be making). I had another colleague who announced one day that he’d finished his novel. I asked when it was going to be published. Yes, I really thought it was that easy. Are you laughing yet? Or do some of my naïve ideas sound eerily familiar? I’ve since discovered my ideas were misguided. But I’ve also discovered there is an element of truth in some of them. This is both wrong and right. Anyone can type 80,000 words and call it a novel. Slapping a cover on it and uploading to Amazon isn’t hard (it can’t be, given the quality of some of the novels on Amazon). But writing a good novel is hard, and not just ‘anyone’ can do it. It takes patience, perseverance, and practice. And most people don’t make it. If you’re prepared to make money writing scam recipe books (using recipes copied from dodgy websites) or scam self-help books (using advice copied from wacko websites) or other scam books (using information copied from Wikipedia), then yes, writing can be an easy way to earn extra cash. Even better, hire someone on Fiverr to ghostwrite (or ghostcopy) the book for you. But is that writing? It’s certainly not the writing dream so many people have. In reality, pursuing a career as a writer, especially a novelist, is going to cost you a lot of money before you earn anything from it. And most writers also have a day job to pay the bills. Once the manuscript is written, editing is just a matter of running spell check, followed by a quick read-through to make sure spell check hasn’t missed any your/you’re or their/there/they’re errors. That’s editing. No, that’s running spell check. Editing goes into a lot more detail, and a good novel will have one gone through several stages of editing before it is published (not to mention being read and red-penned by critique partners and beta readers before it goes to the editor). And then it will be proofread—which is different again. Check out your local bookstore. Check out the publishers of those novels. Getting your novel published by one of those publishers isn’t easy. It’s a long way from easy. But the advent of vanity publishers and self-publishing make it easy to find a publisher. Any vanity press will take your money, tell you you’ve written the next great American (or Australian or British or Canadian or New Zealand) novel, and for another $10,000 they’ll be able to put your novel in front of influential Hollywood producers (and take a first-class holiday in some swanky resort). But self-publishing platforms such as Amazon, DrafttoDigital, iBooks, Kobo and Smashwords do provide newbie authors with a way of getting their novels published and printed and on sale. And it’s not difficult. But authors soon find that writing and publishing was the easy part . . . This is the final myth, and is one that continues to drive new authors to traditional publishers. They don’t want to be involved in the publishing or the marketing. They want to write. Period. The problem with this myth is that all authors, no matter how they are published, all authors have to do more than write. Even traditional publishers expect authors to contribute to their marketing efforts. At the very least, these will include a website (which the author pays for), social media profiles and regular updates (which the author undertakes herself, or pays someone else to manage), and attendance at certain industry events and conferences (which the author pays for). These efforts may or may not sell books. Self-published authors have sole responsibility for marketing — there is no one else. They can just write, but then it’s likely no one will buy their books. Yes, there is an element of truth in each of these five myths. But more myth than truth. Oh, well. Back to the writing . . . Writers, what myths have you heard that you now know aren’t true? Readers, what do you believe about writers that might not be true? Over the last two weeks, I’ve covered what needs to be included in your book’s front matter, and what needs to be included in the author information. Today we’re looking at what else goes in your back matter (also known as end matter). Back matter is prime selling space. If your reader has enjoyed the book (and we hope they have), they want to find out more about the book, the series, and the author. The back matter is your opportunity to capitalise on that interest and turn a reader into a fan. Good back matter sells books. And this starts with the book list. There is probably some fancy psychological term for what comes down to pleasure. If the reader enjoyed your book, they want to replicate that feeling of enjoyment the easiest way possible: by buying and reading another of your books. As an author (and especially if you’re a self-published author) you need to capitalise on your reader’s lack of impulse control. Your back matter should include a list of all your books, especially if this novel is part of a series. Include a list of all the books in the series in reading order. You can also include older books, either in series order or in reverse order of publication (i.e. newest first). If the book is part of a series, make sure you include information sales on the next book in the series (e.g book description and release date). The best time to persuade a customer to buy your next book is when they have happy feelings about the current book. We will not discuss how much money I spend this way. If your book is an ebook, make this list into hyperlinks to a retail site (Amazon, or whichever site the book was purchased from). If the book is part of a series, include the buy link or pre-order link to the next book in the series. If it’s not yet available for pre-order, direct them to a page on your website where they can sign up for your email list so they are the first to know when the new book goes on sale. A great book followed by comprehensive back matter is your best marketing tool for the next book. Take advantage of it. Make it easy for your readers to buy your next book. A trade publisher may also include links to other books in the same genre by other authors from their publishing house. Your objective as an author is to sell your books. Their objective as a publisher is to sell books: yours, and those of all their other authors. Self published authors realise the importance of having an email list. Savvy authors will include a link to their email list in their back matter. They may also offer an incentive for people to sign up to the list e.g. a free novel or novella. Positive reviews from customers are an important feature of Amazon, and other retail sites. Less than one reader in a thousand will review a book simply because they enjoyed it—mostly because they don’t know how adding their review helps an author. Adding a request for a book review on Amazon, Goodreads, or your favourite online bookstore will help boost your review rate. This, in turn, will make your book look more popular (which can help with sales), and will increase your chances of getting a BookBub advertisement. The rise of book clubs means a lot of novels include discussion questions at the back of the novel. These make it easy for the book club host to facilitate the discussion. Discussion questions usually take two pages of a standard paperback. Some authors and publishers include excerpts from other books as a hook to entice the reader to buy now. This is obviously an evil plan designed to part readers from their money. This is a great idea, but don’t go overboard. I’ve read novels with so many excerpts that it affected my perceived pacing of the novel and therefore my enjoyment. The first chapter from an unrelated standalone title in the same genre. The first chapter of the first book in another series. A trade publisher may also include their own website information, an invitation to sign up to their email list, or an invitation to join their book blogger/review programme. A novel might include a list of reference either in the Author’s Note, or separately. Fiction authors usually include just a simple list of book titles and authors, ordered alphabetically on the title. References in non-fiction are more complex. They need to include more information—title, author, publisher, year, and the exact page or chapter reference. They are formatted according to the publisher’s style guide. This could be the Chicago Manual of Style (CMOS), Associated Press Style (AP), the Christian Writer’s Manual of Style (CMS), another style guide, or an in-house publisher guide. Paperback or hardcover non-fiction books may include footnotes, but these can mess with the formatting in ebooks. Many newer books use endnotes instead. These may be at the end of each chapter, or at the end of the book, but before the index. Non-fiction books (other than memoir) need an index. Indexing is a specialised skill, and should be completed by your publisher or a qualified freelancer. The convention is that the index is at the very end of the book. This makes it easy for readers to find the information they are looking for. I have come across some small trade publishers which do not include back matter in their books. This, to my mind, is a problem. They are missing out on potential sales. They are also depriving you, the author, from the opportunity to connect with readers. If you’re trade published, ask (or getting your agent to ask) what information your publisher includes in their back matter, and what you will need to contribute (e.g. discussion questions). What else do you like to see included in the back matter of a book? How much is too much? Subscribe to my monthly newsetter, and receive an exclusive free guide to publishers specializing in Christian fiction. You're subscribed! Check your email for your exclusive guide to publishers specializing in Christian fiction. If you don't get it within ten minutes, email me at igoulton@christianediting.co.nz. March Marketing Challenge – You’re In! Christian Editing participates in a range of affiliate advertising programs, including the Amazon Services LLC Associates Program, an affiliate advertising program designed to provide a means for us to earn fees by linking to Amazon.com and affiliated sites. I am an affiliate for many of the products and services I recommend on this site. I only promote those products and services I have personally investigated or used, and which I believe deliver value. © Christian Editing Services 2013-2018.